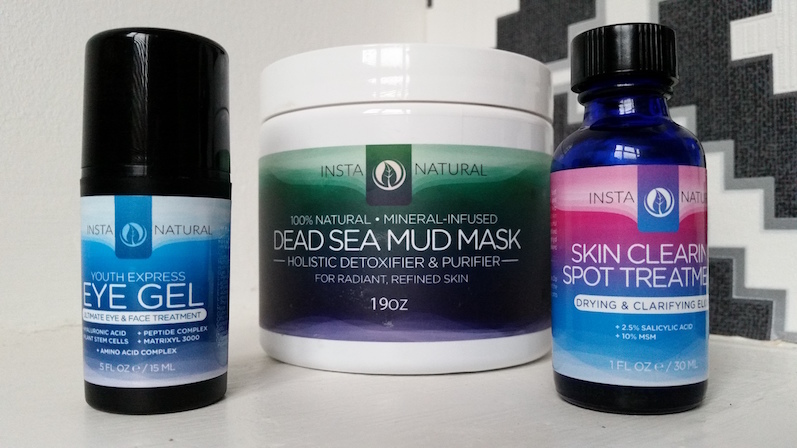 Recently I've been trying out a whole bunch of InstaNatural products, but today I have not one, not two, but THREE InstaNatural products to share with you (woohoo!). Today I have three facial skincare products, the InstaNatural Dead Sea Mud Mask, Eye Gel and Skin Clearing Spot Treatment. I've spent some time testing them all out to give you some feedback, so I'll break it all down and go through each product one by one, starting with the Dead Sea Mud Mask. InstaNatural's Dead Sea Mud Mask is a 100% natural, deep cleansing, pore minimising, naturally moisturising mask for all skin types. It combines mud from the Dead Sea (which contains minerals such as Bromine, Sodium and Magnesium) with aloe vera, organic shea butter, jojoba oil, hickory bark extract and calendula oil to create a mask to perfect your skin. In addition to moisturising, the mask is also designed to help with acne and blemishes, fine lines and wrinkles and to even out the complexion. It can also be used as a body mask to ease muscle aches and pains. The mask comes packaged in a large, white tub with a screw cap lid that holds 19oz of product. The mask is black in colour and is really thick in consistency, meaning that when it is applied to the face thinly, it looks more grey-brown. Whilst we are on the topic of thin layers, I recommend that you do follow that instruction. This is a hard working face mask that caused some itching where I’d applied it a little too thickly on my neck, but everywhere that I’d applied it properly was fine. On removal, my skin did go quite red in areas, but it soon faded. To follow it up, I used the InstaNatural Retinol Serum, Retinol Moisturiser, Eye Gel and Spot Treatment (the latter two are discussed below) and my skin felt and looked incredible. It looked refreshed, pores minimised and it feels super soft. I also tried it on my shoulders as they're always aching by the end of the day, and it did help somewhat with the muscle aches. This is a mask that only needs to be used once a week as excessive use can dry out the skin, so stick to once a week and you'll be reaping in the benefits too! This is probably the best face mask that I’ve tried in regards to results. Not only can I feel a difference with my skin, but you can see it. Highly recommend! 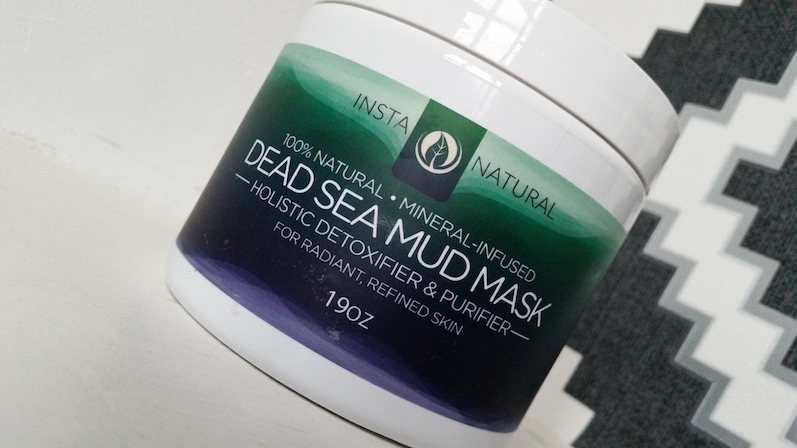 You can purchase the InstaNatural Dead Sea Mud Mask for £21.95/19oz from Amazon. 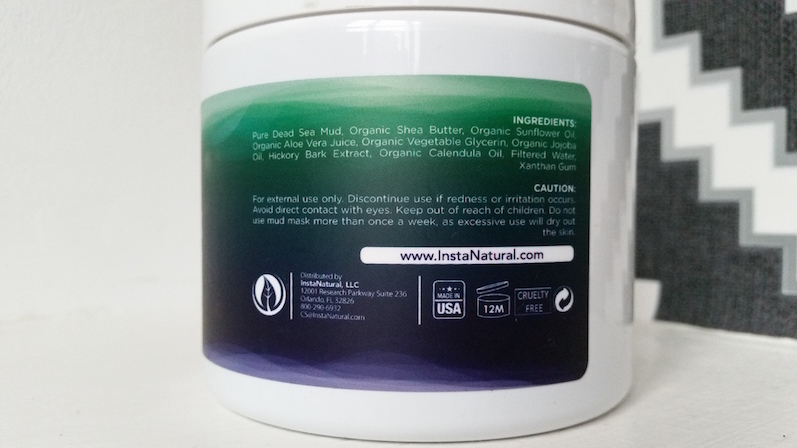 The InstaNatural Eye Gel is interesting as it is not only for the eyes, but it can be used on other areas of the face too, such as the forehead and cheeks. It is designed to reduce the signs of ageing around the eyes as well as to reduce dark circles and sagginess. It contains Matrixyl 3000, a powerful anti-ageing ingredient to restore and firm the skin. 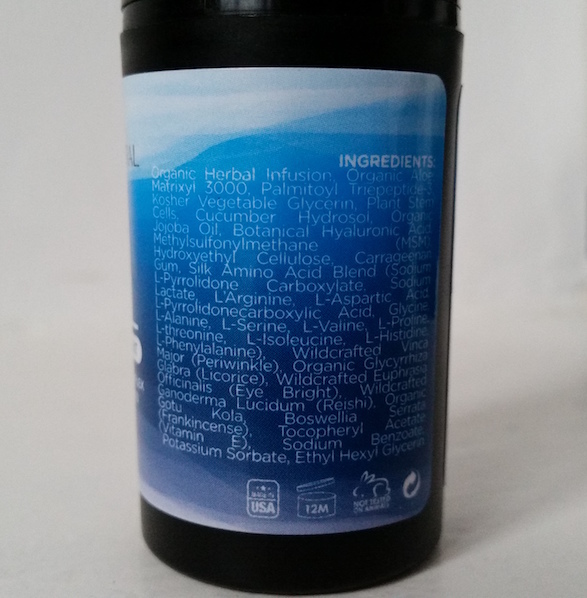 It also includes Hyaluronic Acid to lock in moisture and a blend of amino acids and plant stem-cells to protect against the sun and other aggressors as well as strengthening the skin. I have myself a bottle of the travel version of the Eye Gel, which contains 15ml and comes in a black bottle with a squeeze pump lid. The gel itself is a foggy, white, thick-ish gel. The full size comes in a white bottle that holds 50ml instead. To use, squeeze a small amount onto the finger (take it easy on the pump as a gentle press extracts a fair amount of product!) and dab into the eye area until absorbed. You can also apply the gel to the face. I have really been enjoying this eye gel as I find it very soothing, so it is perfect first thing in the morning to help to perk up the peepers. I also find that it sits well underneath makeup and helps to plump out fine lines around the eyes pretty well and isn't irritating in the slightest. However, when it comes to dark circles it is more average. It works, but I have used other products that are better in this particular area. Overall though I still like this Eye Gel a lot. It's a good product that will suit all kinds of tired eyes and those with fine lines beginning to appear around them. 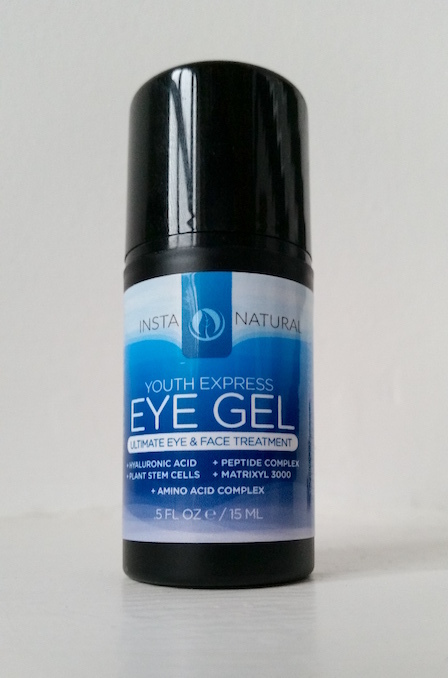 You can purchase the InstaNatural Eye Gel for £13.99/15ml from Amazon. InstaNatural's Skin Clearing Spot Treatment is a different type of blemish beater. Coming from a woman who has had a lot of trouble with battling spots in the past, I don't recall using one that works in the way that this one does. It is a watery formula that contains Salicylic Acid and MSM as well as bentonite clay to give the skin a purified look. You do not shake it before use. Instead, just open the lid and dip a cotton bud straight down to the bottom of the bottle (if it reaches, my cotton buds don't quite make it!). Remove the cotton bud and dab the treatment onto blemishes and wait for it to dry. I have had some success with this Spot Treatment, but there are some downsides. I find that it works better on spots that are just appearing and blackheads rather than "regular" spots. Granted I only get very few nowadays, but I did have a couple to test it on and I have had treatments that have worked far faster on those type of spots than this. Like I said though, this worked a dream on blackheads for me, so if that it your problem then this is still worth checking out! 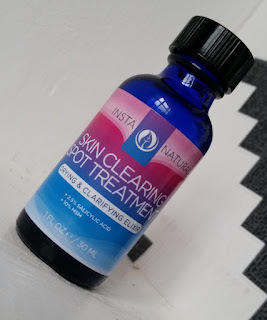 You can purchase the InstaNatural Skin Clearing Spot Treatment for £17.95/30ml from Amazon. So there we have it! Three more great products from InstaNatural! What are your thoughts on the products above? Which one takes your fancy the most? *These products were sent to me to sample as review considerations. However, this hasn't in any way affected my review with all thoughts and feelings about the products being 100% my own.